I’m a Roger Federer fan. Usually, this leads to nothing more straining than a few hours spent watching tennis four times a year. Last night, however, went to another level. Federer played Robin Soderling (a Swede) in the quarterfinals of the US Open. When Federer came onto the court (immediately after Melanie Oudin’s emotional loss — more on her later), Arthur Ashe stadium was pumped full of — you guessed it — Darth Vader’s theme music from The Empire Strikes Back! Patrick McEnroe, in his pre-match set-up, even referred to Federer as “Darth Federer.” This, I think is an interesting phenomenon. Federer, a quintessentially sweet Swiss, compared to, and greeted like, the evil Empire? Federer proceeded to absolutely demolish Soderling in the first two sets (6-0, 6-3). It wasn’t even close. The crowd started to cheer on Soderling, it seemed, just hoping for some spine! But then, Soderling began mounting his comeback. You could almost hear the announcers say, “Can anything good come out of Marietta?” Oudin finally lost last night, to Caroline Wozniacki, but the crowd was pulling for her the whole time. When her match ended, Federer, the evil empire, came onto the court. The third set of the Federer/Soderling match was close, and went into a tiebreaker. Magically, Soderling, spurred on by the crowd, won. The turn of the crowd from “in awe of Federer” during the first set to “frantically pulling for Soderling” during the fourth was palpable. They were simply continuing to root for Marietta, Georgia. Nathanael, one of Jesus’ disciples, famously said, when told about Jesus for the first time, “Can anything good come out of Nazareth?” We WANT our good things to come out of Nazareth. 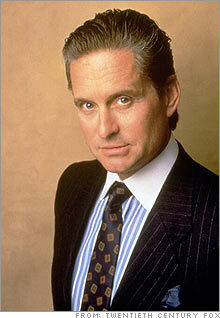 We play evil marches when Roger Federer steps onto the court, we root for Bud Fox to take down Gordon Gekko. We need a savior that comes from Nazareth. Despite who we find ourselves rooting for in tennis matches and movies, this is counter intuitive. We are still enticed by riches and good looks. We remember Gordon Gekko and Roger Federer. Eventually, we forget Robin Soderling and Bud Fox. Bud Fox? Who remembered THAT name? But for people like us, who so often come from Nazareth ourselves, who feel that we are up against the evil empire and are taken advantage of by Gordon Gekko, it feels awfully good to have a savior from our hometown, be it Nazareth, Marietta, Depression, Loss, Loneliness, or wherever you call home. Hard to believe that the "quintessentially sweet Swiss" is the Yankees of tennis. But you probably don't want to discuss tennis. I like what you're saying about Nazareth, makes me think about Jesus coming from Yuma. Pretty much the same right? That somehow makes Nathanael's comment more apt and my need for Jesus more real. Good post! Ha! For those of you Mockingbirders out there who are unfamiliar with Yuma, it is the ULTIMATE American Nazareth. Over 100 degrees every day from May 1 to Halloween. No exaggeration. A couple of Mockingbird posters hail from there, and are more sanctified for it!